I beat Cepheus at several matches (700 hands) of Poker. 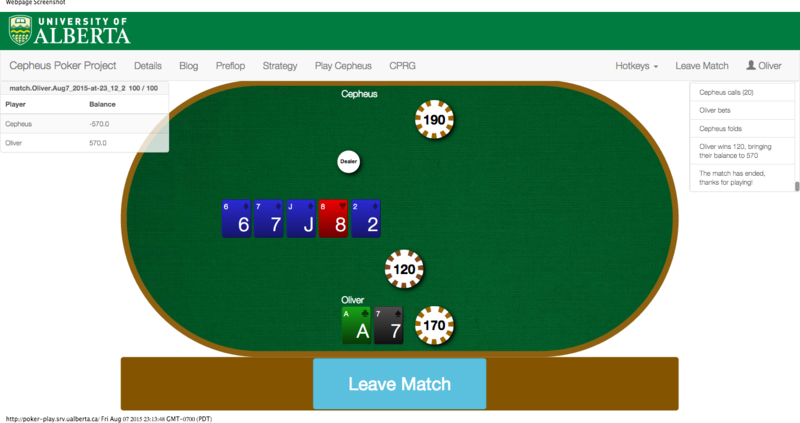 For those unaware, Cepheus is the "unbeatable" poker machine developed by a team of Computer Science PhDs at the University of Alberta. What makes this victory interesting is that I am less than novice - I have played Poker about dozen times (with a career loss of $15). Cepheus, on the other hand, has the experience of a billion billion hands, a memory of over 11TB of poker plays, crunched at 6 billion hands/second. 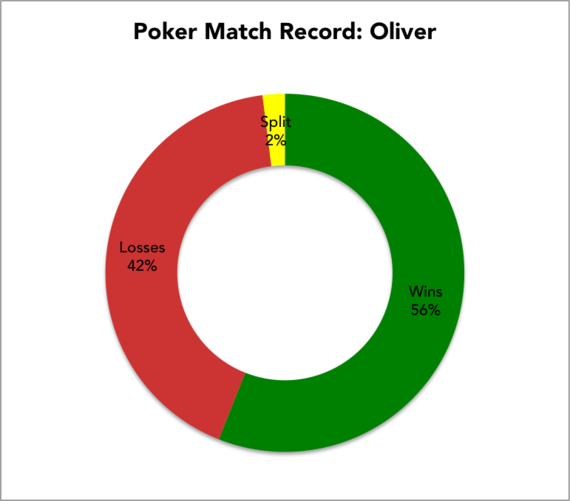 Although computers have mastered games such as Chess, Checkers, and Connect4, Poker is distinct because it lacks perfect information - your opponent's hand. "A perfect solution to the game is a strategy that is guaranteed to not lose money in the long run. 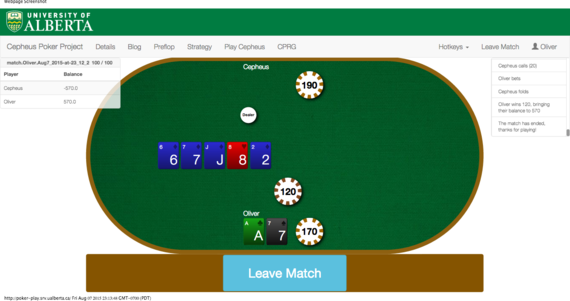 While Cepheus does not play perfectly, it is so close to perfect that even after playing an entire lifetime of poker against it -- over 60 million hands -- it is impossible to tell the difference. It is essentially perfect." The keyword is long run. The reason I was able to beat Cepheus was because of the brevity of the matches. However, as John Maynard Keynes would say, "in the long run, we're all dead." In other words: it is rather impractical to rely on probabilities that approach one when it is intrinsically linked with forever. A more impressive feat would be a monkey who could produce the works of Shakespeare, given sufficient time. Given the claims of perfection and my handicap, my chances of winning would seem impossble. Perhaps I got lucky. What struck me about Cepheus was how aggressive it was during preflop. It seemed like it was trying to shake me like a Polaroid picture. Reluctantly, I made calls I wouldn't normally make because I wanted to see what cards the machine was holding. At times, paying to play played off. We can't talk about poker without paying homage to the late John Nash, who tragically passed away with his wife last May. Dr. Nash (Noble laureate and protagonist in A Beautiful Mind) developed the idea of "Non-Cooperative Games," in which a player must decide on an action (e.g. check, call, raise) without knowing the reaction of the opponent. 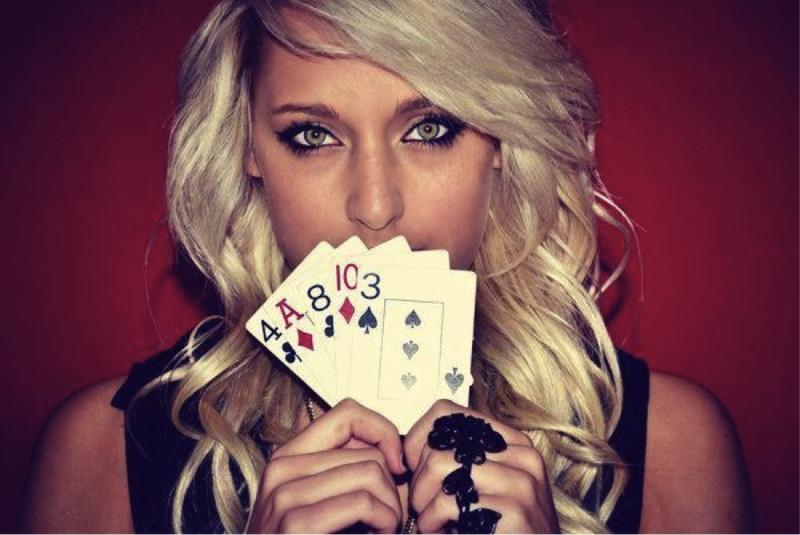 With a database of over a billion billion hands, Cepheus is able to calculate the probabilities of it's opponent's actions, and therefore, predict a favorable outcome even if it means folding the winning hand. In Poker, limiting losses is as important as maximizing gains. 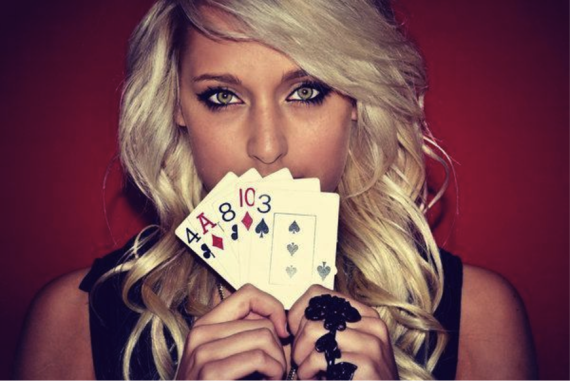 While it is possible to bluff Cepheus, playing poker without risk is not risk at all. Poker with humans involves consequences, which is never absent from emotions. After all, Russian roulette is not the same without a gun. Think you have what it takes to break the machine? Deal with it.